"Each Open Pollinated generation produces offspring true to the generation before, a characteristic that distinguishes OPs from hybrids. (Hybrids do not remain true in generations after the initial cross between two parent plants.) Heirlooms and OPs are usually well adapted to their region, making them especially valuable to farmers and gardeners. Each variety is genetically distinct, having evolved within its own ecological niche over thousands of years. Plant breeders use heirlooms and OPs to breed insect, disease, and drought tolerance into modern crops. When a plant variety disappears, its potential to aid us in the future is lost forever. " But if you ask me, growing heirlooms or eating heirlooms, it's an experience in itself. A remember of the convoluted pathways that evolution can take, to make a fractal broccoli head, or a lobed pumpkin right out of Cinderella. More importantly, they are a genetic resource and history from which we can draw, to shield ourselves against whatever nature can throw at us. We've selected a couple varieties that do especially well in Michigan's northern climate as well as some more unusual varieties I've been dying to try. I'm new to many of these, since they didn't grow as well in Colorado, and am very excited to try them! 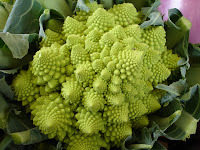 Don't worry, we've ordered a couple varieties for most crops, so you won't be eating fractal broccoli all season! Broccoli Romanesco-"Produces a stunning apple-green whorled head with better taste and texture than most of the finest broccolis. Widely grown and prized in Italy. Grows exceptionally well in cool northern areas. "-Seed Savers Exchange. Wapsipinicon tomato- This is a "peach" variety of tomato that produces peach-like fruit, 2" round fuzzy yellow fruits that are sweet and juicy and won Seed Savers Exchange's 2006 Heirloom Tomato Tasting! "It originated with Elbert S. Carman in 1890 under the name White Peach. This strain came from Dennis Schlicht and is named for the Wapsipinicon River in northeast Iowa. "-Seed Saver's Exchange. Kellogg's Breakfast Tomato-We're excited to try this West Virginia heirloom, obtained from Darrell Kellogg of Redford, Michigan! 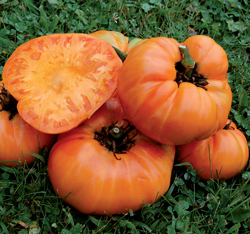 It produces large orange beefsteak fruits that weight 1-2 lbs! 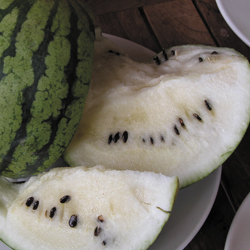 Cream Saskatchewon Watermelon-This'll be a great treat at the end of the season. Brought to Saskatchewan by Russian immigrants, this watermelon does well in cool, northern climates. Round fruits with pale green skin row up to 10" in diameter, about 4-10 lbs. 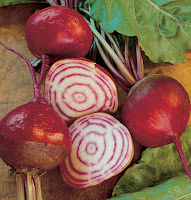 Inside is sweet, white flesh, said to have exceptional flavor. But these watermelon's are also very delicate and must be handled with care! 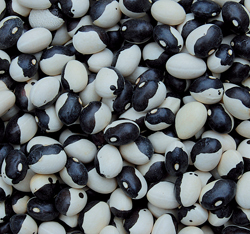 Calypso Dry Beans-We're excited to try this Yin Yang-like dry beans that originated from the Caribbean. It can be used in baking and soups. Chioggia Gaurdsmark Beets-We're trying white beets as well as these cool Guardsmark beets, which rather than red-fleshed are more like bulls-eye targets! Charentais Melon-This one I've grown twice before and is a personal favorite of mine. Musque de Provence Pumpkin-Also called Fairytale pumpkins in the United States, this pumpkin is from southern France, and averages 8-15 lbs. 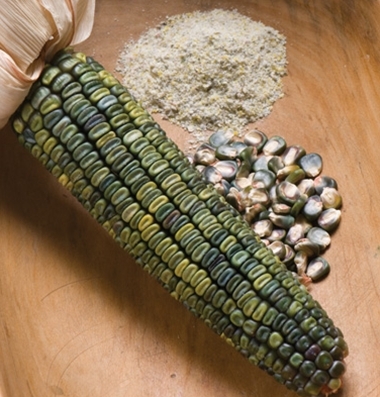 Oaxacan Green Dent Corn-Originally from Southern Mexico, this dent corn (pronounced wä hä' kän), is normally used for decorative uses. As a dent type corn though, it should be palatable for our pigs and chickens. We're trying a small plot of it this year, and if they like it we'll save seed and grow it for feed next year. 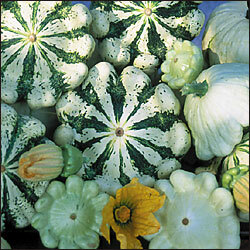 Patisson Panache, Juane et Vert Summer Squash-Who doesn't like squash shaped like flying saucers? 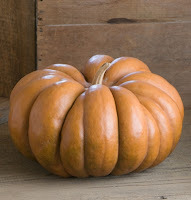 Also called "Scallop" shaped, these squash are great for grilling, roasting and frying. This is a newer French variety with green stripes. Can also be grown to maturity, where the fruit will become rock-hard, like winter squashes, and the fruit can be used for decorative purposes. Looking to a winter seasonal dish? Try this spaghetti squash dish with an Italian twist! 1. In a medium bowl, combine all sauce ingredients. Cover and let stand at room temperature for 1 hour. 2. Prick skin of squash all over with a fork about a dozen stabs. Then bake on cookie sheet at 350 degrees for 1 1/2 hours or until tender when pierced. After 45 minutes or about halfway through flip for remaining time. Let cool 15 minutes. 3. Halve lengthwise and carefully remove seeds and any loose membrane. 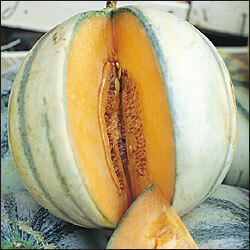 With a fork, scrape the insides of squash and it will come away from the shell in spaghetti-like strands; set aside. Reserve shell. 4. Separately steam or boil chopped carrots, broccoli florets and whole zucchini. When each is cooked, transfer to bowl of cold water to cool and stop the vegetables from cooking more. Drain. 5. Halve zucchini lengthwise and cut into 1/2 inch slices. 6. In large skillet, saute green onions in olive oil until tender. 7. Add drained vegetables and heat thoroughly. Add salt and pepper to taste. Combine hot vegetables, spaghetti squash and sauce. Spoon mixture into reserved squash shell. Serve warm or at room temperature. The farm has frozen to a halt this week here at The Shire. It is under 10 degrees today, and not supposed to be much warmer all week. Luckily, so far we have dodged the lake effect snows that are hitting just to the west of us in Grand Rapids, though that could change soon. Otherwise things around the farm just continue to inch towards spring. We have begun some of our seed purchases, we caught a sale at work and got several heirloom varieties we wanted on sale 20 packets for $1!!! Ender is finally done with his booster shots and now has surpassed 20 lbs. That means he has gained 14 lbs in 6 weeks since we got him, yikes he's going to be big. He has figured out potty training for the most part and will ring a bell hanging at the door to go outside. We are working on sit, lay down, and stay now. He's a fast learner if a scooby snack is involved, though is having trouble with lay down. Don't ever put him on a leash though, you'd think he was being murdered by all his high-pitched whining! He and Katniss love to fight, and Katniss is often the instigator--running out of hiding just to whack Ender on the head three or four times and then run away with him chasing her tail. The chickens are growing like weeds! When we ordered the chickens we ordered 20 hens and then 7 straight run birds, which means a random selection of hens and roosters. As it turns out luck was on our side; we officially have only 1 rooster and 25 hens, thanks Welp! We have begun feeding the chickens some scratch to get them to scratch at their bedding, as well as letting them outside (when it's not freezing). This week though the new challenge with the chickens is keeping their water liquid. We have discovered that this strange phenomenon happens when it is really cold ... water freezes. Crazy, right? So now we have been checking the water every few hours to make sure things are staying drinkable, especially since chickens drink more when it's cold. For more recent pictures of the chickens, check our Chicken Album on our facebook page. Sara offering some hand feeding, they decided to peck her hand instead. Gnocchi is a potato pasta dish, and an easy winter dish. All you need are an egg, some potatoes, butter, flour, a shallot and some sage. 2. Poke each potato about 8 times with the tip of a paring knife. Microwave until the ends have slightly softened, about 10 minutes, flipping the potatoes halfway through. 3. Transfer to the oven, place them directly on the rack and bake until a skewer glides easily in and out of the flesh, about 18-20 minutes. 4. Remove the potatoes and immediately peel, (caution, hot potato!) Transfer to a potato ricer or food mill and process, or use a potato masher to mash by hand. Transfer to a baking sheet, spread evenly and let cool for 5 minutes. 6. Top the potatoes with the lightly beaten egg and use a fork to stir until just combined. 7. Add 3/4 cup flour and 1 teaspoon of salt and gently mix until no pockets of dry flour remain. The dough will not have come together, but will look crumbly. 8. Gather the mixture into a rough ball and transfer to a lightly floured surface and knead for about 1 minute, or just until smooth. The dough should be slightly tacky, if it sticks to the work surface as you knead, add additional flour a tablespoon at a time. 9. Divide the dough into 8 pieces, they don't need to be exactly the same size. Working with one piece of dough at a time, roll it into a long rope about 1/2" in thickness. Cut the rope into 3/4" pieces. Repeat with the remaining dough. If you don't want to cook the gnocchi immediately you can place them on a baking sheet and into the freezer (make sure gnocchi isn't touching) and once they're frozen, transfer them to a resealable platic bag for future use. 10. You can leave the gnocchi as they are and cook them like that our you can shape them with a fork to have the traditional ridges. 1. Bring 4 quarts of water to a boil in a large pot. 2. Add the butter to a 12" skillet, set over medium-high heat. Let it melt and continue cooking, swirling the pan occasionally, until the butter has browned and has a nutty aroma. 3. Remove the pan from the heat and add the diced shallot and sage. Stir and cook with the residual heat in the pan for about 1 minute. 4. Mix the lemon juice and salt into the sauce, cover to keep warm until gnocchi is cooked. 5. Meanwhile, once the pot of water has started boiling add 1 tablespoon of salt to the boiling water. 6. Cook the gnocchi in 2 separate batches, each will only take about 90 seconds. They will float to the top after about 1 minute and should be firm and cooked through when they're done. Use a slotted spoon to transfer the gnocchi to the skillet with the sauce. Repeat with the other half of the gnocchi. 7. Drain, then gently toss them with the sauce and serve. We have planned for enough veggies to take care of at least 20 families that eat a lot of veggies, and would want to save some for winter as well. We are looking forward to exploring a lot of familiar and unfamiliar foods and sharing our experiences and farming methods here on the blog with everyone. Along with planning what we wanted to grow, we have had to plan out where we are putting all these veggies. We knew in general what spot on the land we wanted to use, our property is very hilly, and some of it too sandy to use yet. But in the southwest corner of the farm, it's relatively flat and easily accessible and already in good pasture with nitrogen fixing plants. What I had not considered is how we would like to lay out as huge of a garden as Sara had planned. When I have seen farming in the past it is long rows of corn or soybeans, or small gardens, planted with a few various sections and plants, mostly in raised beds. When you are planning 30+ different crops, enough to feed several families for a whole year, things get a bit more complex. We have had to decide how we would like to rotate crops to prevent disease and pests, how we want to prepare the land the crops will be on, how big the rows will be and a couple dozen other planning decisions that help Sara estimate out how many veggies our garden should minimally produce, and how to maximize production vs. space while protecting the soil at the same time. We drew out the problem using a drafting program I have from when I was in school. We were able to lay out the garden, see what the plant spacing that Sara had planned will actually look like, and before even laying a seed in the ground we can make very precise estimate for seeds required and predicted harvest. Firstly we found that we would need far less space than we had planned! This allowed us to expand how much store-able veggies we could add, such as more dry beans, which will make great soups, chilies, and more. You want me to go out there? Yeah, no. Planning out the garden this thoroughly also helped us think about how we would like to do the livestock. Where we have the chickens now, in the brooder hut, is a temporary coop for raising chicks and where we can "quarantine" new livestock and make sure we won't be infecting our other animals with anything our new addition brought with them! They are quickly outgrowing the chicken coop, and though they've shown no inclination to go outside, even on our sunny 35 degree F days, but they will in the spring, and the yard for them is too small. We realized that based on what we need of our buildings, the potting shed would be an ideal chicken coop and feed storage place. It will allow the chickens almost twice the living space indoors, and we won't have to buy a silo. Win-win. The building is also better ventilated and insulated than the brooder hut is. Most beneficial, the potting shed has nice pasture to the west, where the chickens will be able to graze among the other livestock. Before moving the chickens, we have to build a wall dividing the potting shed interior, make new roosts, cut a dogie door to the outside, and construct some nesting boxes. We started by building a frame for a chicken mesh wall and door to segment the potting shed into two areas. This being one of my first building projects it had some fun obstacles. Yay for free wood, reclaimed! We got almost all the materials we needed by taking out the makeshift wooden floor/platform the previous owners used to hold their beehives in winter. (We found a few new projects in the process out in the barn, but we'll save those for later.) We've been lucky though, since the tool shed and potting shed were already here, but we've also used existing materials like branches for roosts, and now reclaimed wood for the coop. By doing this our infrastructure costs so far for the chickens have been kept minimal, which has been one aspect that has been pretty great about the chickens. Well that is all for this big update we'll follow up this week with some more specifics about the many projects we have been working on. Here's some links to some of the files we mentioned above. And more information should follow in some more blogs soon. Who doesn't love sandwiches? This is our newest favorite, very easy to make and I'm sure could be embellished upon, hmm, think sun-dried tomatoes or roast chicken. Nom nom nom. 1. Spread the basil pesto on one side of each the bread slices, then crumble feta cheese over. 2. Slice avocado in half, use a spoon to loosen the flesh away from skin and make long slices down the avocado. Distribute 1/2 of avocado per sandwich. 3. Put small handful of baby spinach leaves on other bread slice. 4. "Assemble" your sandwich. Get a medium or large skillet and place over medium heat. When heated, melt 1/2 tablespoon in the skillet. 5. When butter is melted and foam has subsided, place your sandwich in the skillet. Or if you have a panini press, use it. Press down on the sandwich with a large spatula. Or, you can put a plate upside down, over the sandwich and weigh it down with a can to distribute the weight. Do so for 2-4 minutes. 6. When toasted, transfer to a plate. Put another 1/2 tablespoon of butter on the skillet and melt, then flip the sandwich back into the skillet. Cook under skillet or plate for 1-2 minutes until toasted. 7. Repeat with second sandwich. Serve!